One way to feed your soul at Saint Anne's is by assisting with worship. The groups below would welcome your time and talent. Details can be found in the weekly announcements (on the home page) and on the Saint Anne's Calendar. Saint Anne’s ministry teams are open to anyone wishing to serve, though some require special training. Saint Anne's is an intergenerational church. We invite people of all ages to participate; children are invited as soon as they are ready. The Saint Anne's Chior is Open to all singers. Rehearsal Wednesdays 7:30-8:30, and Sunday mornings at 10:00. The choir does not sing in the summer, except on St. Anne's Day (last Sunday in July). 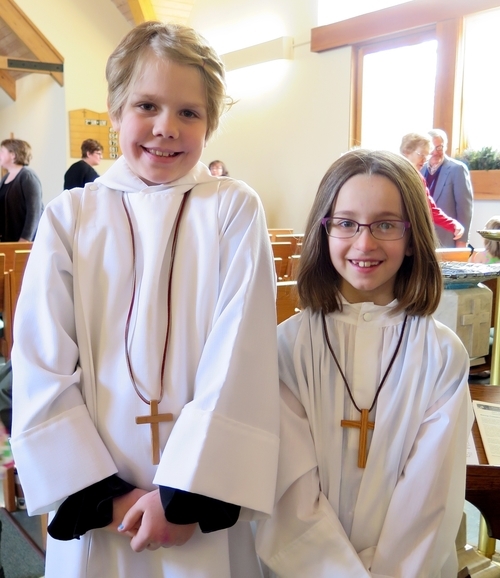 Acolytes are children age 8 and older who help lead worship by carrying the cross in procession, and assisting the deacon and priest at the altar. Sunday Club Teachers lead Saint Anne's children in prayer, projects, and learning. The Altar Guild always invites new members. Men, women, and families are invited to help prepare the altar and sanctuary for worship. The Garden Club keeps our grounds cared for and make them even more beautiful. Lectors read scripture passages, prayers and intercessions for Sunday worship and special events. Hospitality Ministers provide, serve, and clean up coffee and snacks after our 10:30 service. This important ministry makes a very beloved and important part of our community's life possible. Helping Hands provide rides, meals, and general help to parishioners as needed. Feed your soul while helping others. Vergers are the choreographers of the 10:30 service, making sure everything and everyone is in the right place at the right time as we worship. Vergers lead the procession, assist the acolytes in serving at the altar, and allow the priest and deacon to better focus on the worship service.